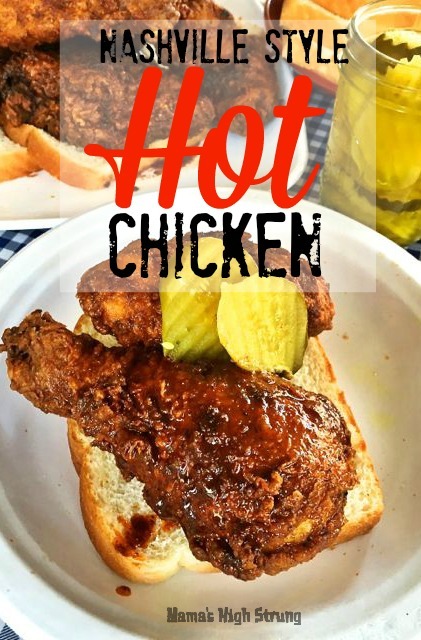 If you love spicy food, I mean, really, really LOVE all things fiery and flavorful, then you’re ready for Nashville Style Hot Chicken. I’m telling you, this atomic fried chicken is guaranteed to burn your face off. Ah, the eye-watering pain. The mouth-burning agony. It hurts (and tastes) so good. Yes, there are a lot of spicy fried chicken recipes out there. But what makes Nashville Style Hot Chicken so unique is the “sauce” that is brushed, dipped or poured over the chicken just before serving. That sauce is so delicious; you have to serve it with a slice or two of good old-fashioned white bread to soak up all the drippy goodness. Oh, and you definitely need some good pickles to gussy-up the plate. That’s part of the presentation. You don’t want to go to all the trouble of making Nashville Style Hot Chicken and leave off a traditional garnish! Several (now famous) places in Nashville have been serving Hot Chicken for decades. But as we all know, it only takes one hip website or famous food show star to get the rest of the country clamoring for the next BIG THING RIGHT NOW. But what in the world is Nashville Style Hot Chicken anyway? How it came into being is absolutely fascinating, but, then again, I love food history and how it defines our culture, and in this case, a city. Give a read to Dr. Rachel Martin’s post on the website The Bitter Southerner to understand how Nashville’s so-called signature dish stayed hidden in plain sight for so long before exploding into the mainstream. Hattie B’s in Nashville, which offers five heat levels, including “Shut the Cluck Up”, inspired my Nashville Style Hot Chicken recipe. I’ve changed it a bit by adding some spices to the flour. Like Hattie B’s recipe, I dredge the chicken pieces (breasts, thighs and legs only) twice in the flour before frying. But I don’t add quite as much cayenne pepper as Hattie B’s because, well, I may be a little high strung, but I’m not crazy. Read this recipe all the way through before you begin. I just heard you gasp. That’s right, one of the ingredients in the secret sauce is one cup of the hot oil from the skillet where the chicken is fried. But, like I always say, you don’t eat like this every day, and I know how much you love fried chicken! Place the chicken in a large bowl and rub it with the salt and black pepper; cover and let it hang out in the refrigerator for 3 hours (or overnight if possible). Let the chicken stand at room temperature for about 45 minutes before cooking. Set a wire rack inside a large rimmed baking sheet lined with paper towels. Whisk the flour, garlic powder, paprika, cayenne pepper and salt together in a 9x13x2-inch baking dish (like a lasagna pan). Beat the eggs, buttermilk and hot sauce together in a medium bowl; set aside. 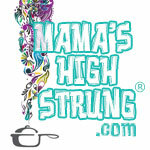 Heat the oil in a large (10-inch or 12-inch) skillet or other heavy straight-sided skillet (not nonstick!) to about ¾-inch deep. Prop the deep-fry thermometer in the oil so the bulb is submerged, but not touching the bottom of the pan. Heat over medium-high heat until thermometer registers 350°F. Using 1 hand for dry ingredients and 1 hand for wet ingredients, dredge 1 piece of chicken in the flour mixture. Shake off the excess. Dip the chicken piece in the buttermilk mixture; shake off the excess. Dredge the chicken in the flour mixture AGAIN and shake off the excess. Place 4 to 5 pieces of chicken in the skillet, depending on how much room you have. Working in batches, fry the chicken, turning with tongs every 1–2 minutes. Adjust the heat to maintain a steady temperature of 325°F. Cook until the skin is golden brown, about 10 minutes for wings and 17 to 20 minutes for thighs, legs, and breast quarters, and an instant-read thermometer inserted into thickest part of chicken reads 165°F. Remove chicken from skillet with tongs, allowing the excess oil to drip back into skillet; transfer the cooked chicken to the rack. Repeat until all of the chicken is cooked. Ladle 1 cup of hot oil into a small saucepan or heatproof bowl and whisk in the cayenne pepper, dark brown sugar and chili powder. 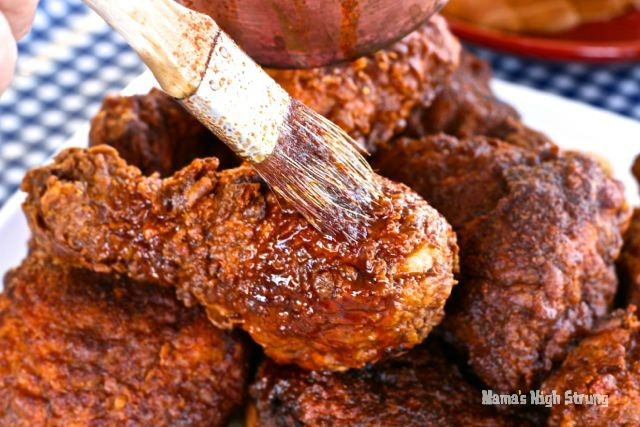 Brush or baste the sauce over the Nashville Style Hot Chicken. Serve on a slice or two of white bread with a few pickles. That is fantastic looking chicken! I’m a bit of a wimp on the heat scale, but my spouse would love this! Thanks so much Christy! It is really flaming hot so you better stay away! I don’t know about the white bread and pickles, but the chicken sure looks good. Thanks for sharing on the Creative K Kids Tasty Tuesdays. I hope you will join us again next week. 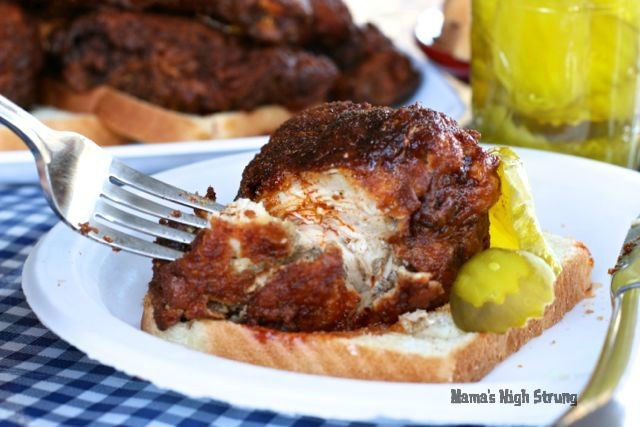 I have never heard of Nashville Style Chicken but my husband would love it. Also never heard of using the oil it was cooked in. Intriguing. Hi Bev! 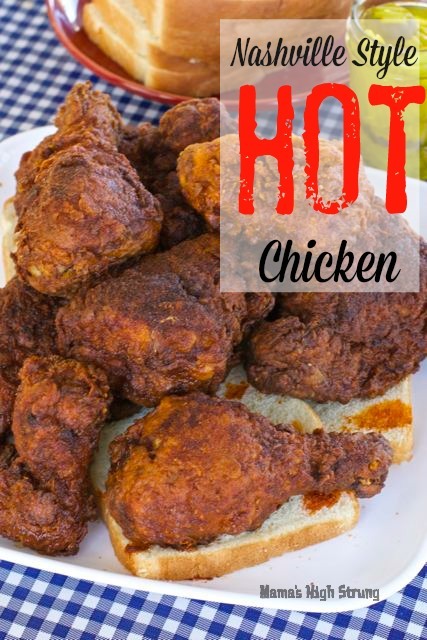 I didn’t know what was the secret to Hot Chicken until I did my research. It’s one of those things that you say Yay or Nay because it is really, really caloric! But this is a splurge and so delicious. Thanks for stopping by. I’ve been eagerly waiting for this here recipe and it sure looks to not disappoint! Bring on the spicy Nashville! Thanks Peggy! Let me know what you think!